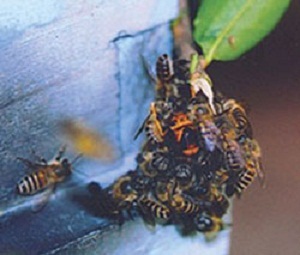 If the honey bee bites any person of animal, it cannot pull the stinger from the body of the person or animal and in the process of taking out the stinger, the honey bee dies. So to protect from the enemies the honey bees adopt one process in heat is generated, known as thermo balling. The honey bees can be safer at 50 degrees centigrade temperature also. But their enemies like wasp cannot sustain that much heat. So whenever enemies comes the honey bees will start flapping its wings, which would make the temperature go by 47 degrees in their surroundings and the creatures will die as they cannot sustain that high temperature. With this method, the honeybees will ensure no fungus get accumulated on their honeycomb.